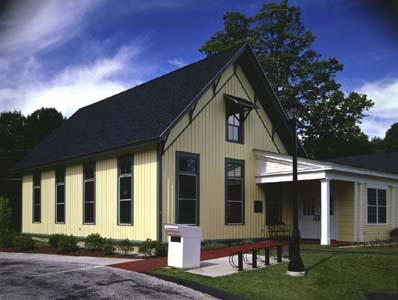 The New Hartford library is a new building completed in October 1996. The main part of the building is designed in the Greek revival architectural style to fit in with the prevalent architectural style of New Hartford. The rear of the library is decidedly different. This portion, which makes up the Children’s Room, is designed to seem like a later building subsequently joined with the main building. In contrast to the sober nature of the main building, the Children’s Room is a tall vertical carpenter gothic building intro­ducing a more playful theme consistent with its use by children. It also recalls the Victorian era train depot which once delighted visitors on this site with its welcome to New Hartford. Inside the Children’s Room, the ceiling ar­ticulates the shape of the steep roof above, in keeping with the Victorian feel of the exterior. The architectural millwork and colors reflect an appro­priately Victorian character as well. Adorning the walls are a unique collection of original artwork in donated frames for illustrations in famous children’s books. Oversized openable windows face east and south to fill the room with cheery sunlight all day, and a hidden movie screen descends from the ceiling for movies, videos, slide shows to allow the library room itself to double as a lecture hall. Another feature which is less apparent is the heated floor — daily events including three story times, playtime for 1-year-olds, as well as movies and presentations are made comfortable for child and parent (and the full time children’s librarian!) alike who feel comfortable sitting or standing on the warm floor, especially on wet and chilly gray days. If success of a library design can be measured by its increased usage, then the New Hartford library exceeds all standards. Circulation has increased 400% and visitations have increased 1,000%, far above the most optimistic projections.